On the North side of Eastgate Street just after the Eastgate Clock is a small road running up hill to the Cathedral, this is St Werburgh Street. 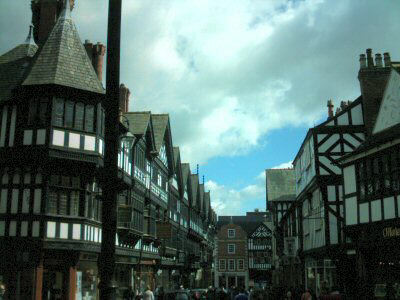 The street contains many black and white buildings which contain shops. 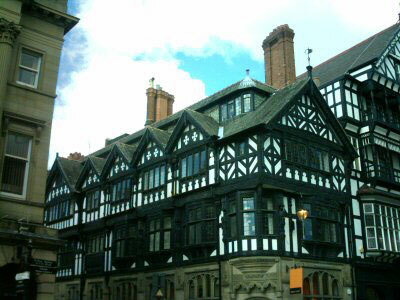 The building are not the original medieval buildings but are part of the black and white building revival of Victorian times. 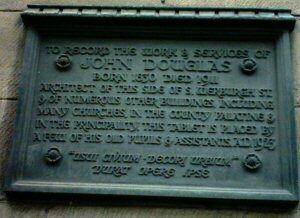 This street holds a 'Da Vinci Code' style secret for when John Douglas remodelled the street, he was aware of the lay line or rose line on the East side of the street which passes straight through the High Altar of Chester Cathedral. 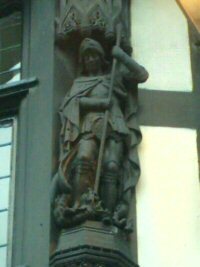 It is said that he marked the position of this energy line with a fine carving of St George slaying the dragon. 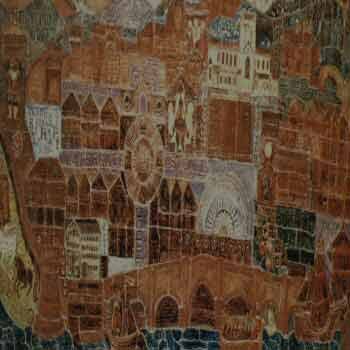 This is said to represent Christianity overcoming paganism. 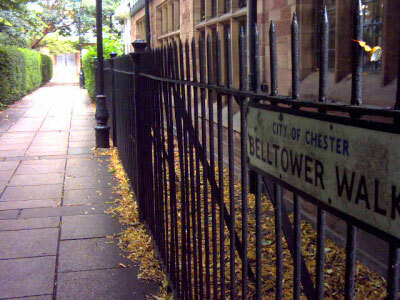 The Street is a short and curves around Chester Cathedral on the way to the Town Hall Square. St Werburgh Street contains many fine clothes shops. Also at the start of St Werburgh Street is the Town Hall Square. Click here to enter the Town Hall. Barclays Bank is on the Left as you walk down from the Town Hall. Clemence House is on the right. Nigel Hughes Jewellers are on the right at the start of St Werburgh's Row. 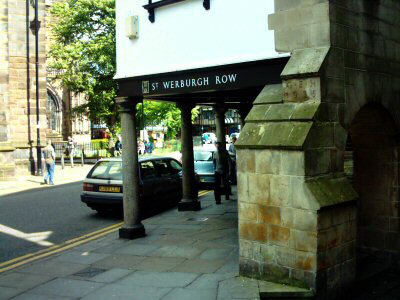 Crystal Shop is on the right at the end of St Werburgh Row. St Nicholas Chapel housing Superdrug. C & G Mullen is on the right at the start of St Werburgh Mount. 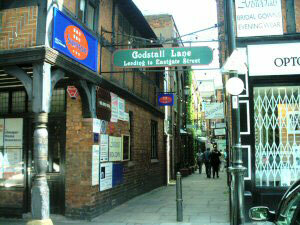 The Entrance to Godstall Lane. Pyramid Glassware is on the right in St Werburgh Mount. 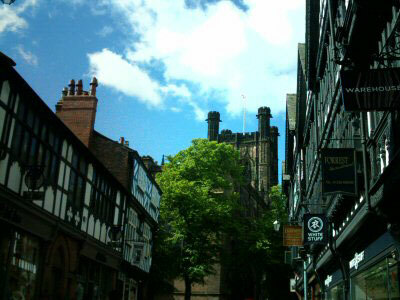 St Werburgh Street brushes past Chester Cathedral. 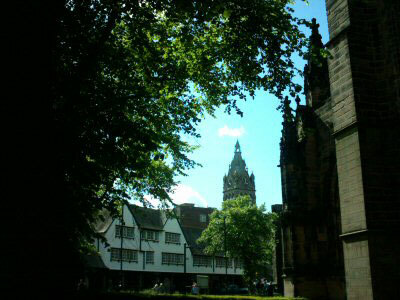 Entrance to Chester Cathedral Gardens. 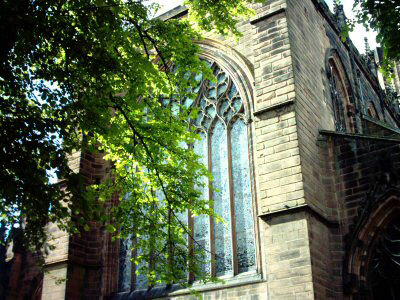 You can access Frodsham Street via Bell Tower Walk off St Werburgh Street. Open every day, Beatons Tearoom & Bookshop is a small, elegant and friendly tearoom first established in Tisbury, Wiltshire, inspired by the elegance and style of Cecil Beaton. Tearoom With a range of over 25 loose leaf teas, brewed to perfection and elegantly served, and selected freshly ground regional coffees. Accompanied by a range of food and home made cakes. 'Tisbury, Blandford and now Chester all open and serving up gracious hospitality daily. At O'Hares, we are passionate about fine jewellery, brilliant diamonds, gorgeous gemstones and exquisite pearls. We love contemporary silver too. In fact, we love all beautiful jewellery. 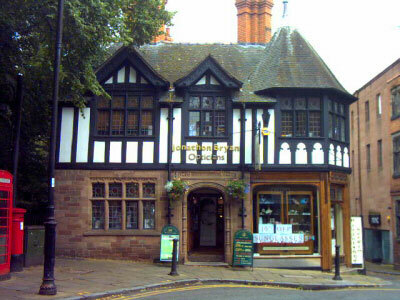 Our jewellery store on St Werburgh Street in Chester, Cheshire has a wonderfully eclectic mix of modern jewellery including designer rings, cocktail rings and dress rings. You will find contemporary jewellery, vintage jewelry, antique jewellery and designer jewellery from the UK, Italy and worldwide. We love finding the right gift whatever the occasion and offer practical advice and no obligation consultations in a friendly environment..
Our expertise and personal service means that if you can�t find exactly what you�re looking for, or if you�re searching for something a little bit different, then let us do the search for you! Looking down hill to Eastgate Street. Soletrader | Buy Ugg Boots,Timberland, Ted Baker shoes, Adidas. Choose from Ugg and Timberland boots, Diesel and Ted Baker shoes and trainers and many more brands. Place your order today for free UK delivery. Buildings at the junction with Eastgate Street.